The Space Heating module contains a wide range of equipment options that can be combined to form a HVAC System. No single concise set of data entry cells exists to accommodate all the equipment options, the various building types, climates hours of use. Designing the right HVAC system for a building’s purpose is a science. Conducting comprehensive load analyses, considering air supply requirements, weather conditions, and determining optimum HVAC system, piping and duct configurations, and then applying those considerations to specifications are all critical to a building design and operating economics. Users are encouraged to visit any of the following resources to identify the correct tool for your specific application. 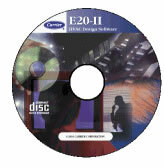 E20-II is a collection of software programs created specifically for the HVAC system designer. These programs are tailored to increase productivity and accuracy, improve analysis capabilities and job documentation, and add a level of "marketability" to a designer's estimates. Individual programs are available to assist in heating & cooling load estimating, annual building operating cost estimating, refrigerant piping system design, and economic life cycle analysis. These programs are written by HVAC systems engineers for HVAC systems engineers, and are supported by more HVAC system engineers with years of field application experience. HAP is a dual function program - full-featured load estimating and system sizing for commercial buildings plus versatile hour-by-hour energy and operating cost analysis. Thermal loads are calculated using the ASHRAE-endorsed Transfer Function load method. System components are sized using the System-Based Design concept, which applies the ASHRAE-endorsed Heat Extraction Methodology to link system performance to building thermal loads. Energy analysis uses full 8760 hours-per-year analysis to evaluate the operation of a wide variety of air handling and plant equipment. Operating costs are computed based on energy use and demand charges. A wide range of tabular and graphical outputs is available. Block Load combines a full-featured design load estimating program with a simplified user interface. Perfect for engineers and contractors who need to generate loads quickly. Provides all of the sizing and load information needed to design HVAC systems and select air conditioning equipment. This program uses the same load calculation method as HAP and System Design Loads and is suitable for both single and multiple-zone projects. All four are bundled in one seamlessly integrated package. The program provides a quick building heat load analysis allowing the user to specify various Reznor HVAC appliances into the design. System Analyzer makes energy analysis easy and clear. It’s the right tool to use when you need to get HVAC energy and life-cycle costs more than just "in the ballpark." System Analyzer helps estimate (but not design) building loads and performs energy and economic analyses, quickly evaluating virtually any building, system, and equipment combination. Used as a scoping tool to decide what systems might be appropriate for an initial design or to get a general idea of how one system-and-equipment combination performs when compared with another.